Murder at the Library: April 13th, 6:00 p.m.
Join us for an interactive murder mystery set in the 1950’s. 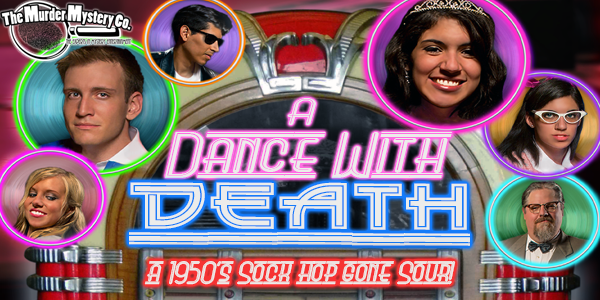 When a death on the dance floor makes a party foul, it’s up to you to figure out whodunit and get the dance back on track. Trade clues, gather information about the crime, and reveal the punk that made this hop nowheresville. Come and help solve the crime! 1950’s attire is encouraged but not required. Here’s your chance to break out your poodle skirt and saddle shoes, your cuffed blue jeans and leather jacket. Word from the bird is this is one show you will not want to miss. This night is shootin’ to be swell despite the disaster. Silent auction and monetary donations accepted at the Library through 6 p.m. on April 12th. You are currently browsing the St. Charles Public Library weblog archives for the day Monday, April 8th, 2019.